This might be described as a 'marmite' book. I was drawn to 'The Unconsoled' based entirely on my enjoyment of 'Remains of the Day' and 'Never let me go' and the confidence that attends the offerings of a consistently great writer. However, though I stuck with it (it's quite long), for me, it never reached those heights. With the belated benefit of reading other's reviews, the responses do appear to be polarized, but notwithstanding those readers who list this book in their top twenty reads, sadly I must confess to feeling rather disappointed. I disliked intensely the surreal twists of the book and derived very little pleasure from it. Indeed, never before have I cared less about the characters and outcomes of any novel. 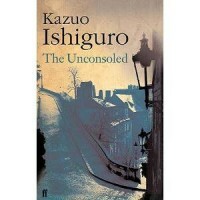 Of course, it is possible that I am merely parading my ignorance, but given my former blissful immersion in the other works of Ishiguro, by contrast I found 'The Unconsoled' was bland and uninteresting. Incidentally I love marmite, but I'm fairly inconsolable about this book!